After 3 months, my Zooniverse internship has now come to an end, and today is my last day here. This experience has been amazing, and I’m incredibly sad to be leaving! I’ve learnt so much, met some wonderful people, and had so much fun here. So on my way out, here are some reflections on my time here. As someone keen to switch into tech but with barely any tech background, this internship has been an amazing opportunity to learn and get some programming experience. I recently gave a talk at the Zooniverse (internally known as a Zoominar) in which I detailed the alternate, pricier routes into tech available, and it really brought home to me that without this paid internship, I wouldn’t be in the position I am now. Even with free bootcamps in London you still have to be able to support yourself financially for months on no income – and I couldn’t do this. But because of this internship, I’ve been able to work on my skills and can now apply for Junior Developer roles – I actually had my first interview today and have made it through to the coding test stage. I’m very grateful to the Zooniverse for this opportunity. Whilst I’ve been here, as well as getting to work on my own personal projects (such as the recently revamped To Do list and my personal website), I’ve been able to make contributions to the codebase that have actually gone through to the main website. With the lovely Meg’s help, I’ve co-written and coded the Volunteering, Glossary and the Acknowledgements pages, and I’ve also added in the Get Involved nav bar section. When I first started here, I never thought I’d be able to add anything, let alone anything worth going up, so I’m very proud of these contributions.When I first looked about PFE, I was a completely lost. But I’ve since learnt about technologies I didn’t know existed and I’ve learnt how to use them – which has been really challenging but fun! As well as being beneficial to me, the Zooniverse has also supported me in contributing to the local tech community. I decided to try to set up the Oxford chapter of codebar, a non-profit organisation that offers coding workshops to underrepresented groups in tech. It brings together these students with local developers who volunteer their time to teach. 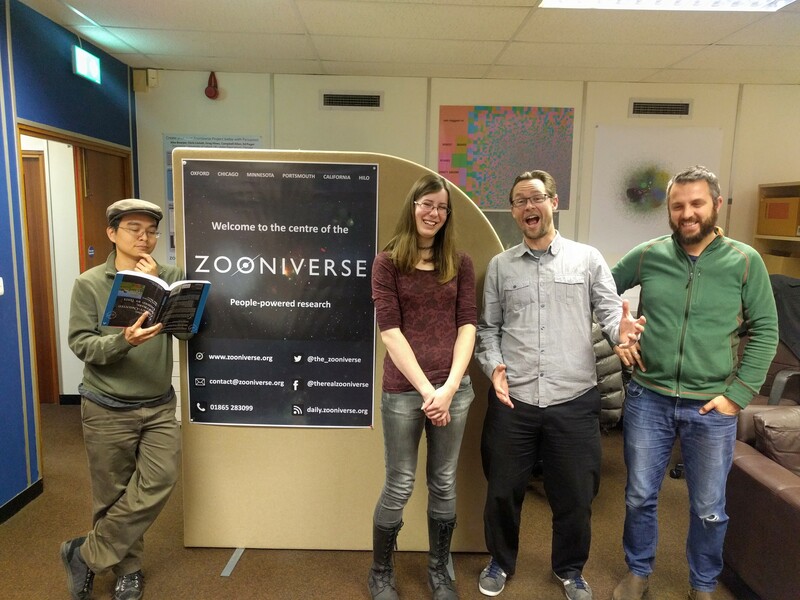 Zooniverse backed the very first workshop, and without this, I really doubt the chapter would have taken off, but since then, I’ve run a second workshop and am currently promoting our third upcoming workshop. We’ve had 50+ people attend the first two workshops and it’s been a huge success. The last of my reflections is that the Zooniverse team is amazing. Nearly every Oxford team member has given me their time, sat down with me, and patiently answered all of my bizarrely worded questions (complete with lots of hand gestures and odd analogies). I’ve never felt like I’m annoying or stupid. We’ve had film nights, gone out to the pub together and eaten together every single lunch. I was even invited to the USA to the annual team meeting. If you’d have told me I’d have been doing all of these things 4 months ago, I’d have laughed, because all of these things would have sounded way out of my comfort zone. But I’ve actually had so much fun, and felt very welcome and supported throughout my time here. I feel like I’ve made some real friends here. To sum up, I’ve learnt lots whilst being here. I’ve learnt that just because you think something will be scary, doesn’t actually mean it actually will be. I’ve learnt a lot about web development. I’ve learnt that teams are actually awesome. I’ve learnt that the Zooniverse team is particularly awesome. And as the weeks have gone by and my tech understanding has grown, I’ve come to realise just how special the Zooniverse itself really is. As Ali said in her farewell blog post from earlier this week, you never really leave the Zooniverse. So on that note, it’s a just a goodbye for now from me, too.